This source book is about beginning the conversation on how we can be compassionate during difficult times. The book is filled with stories from people who put compassion into action—in ways large and small. It contains a Contemplative Reading Guide to use individually or with others in a book club. This offer is a way of sending kindness to people who need it right now and to invite those who have the capacity to influence compassionate action to do so. If you read further you will be directed how to download the free PDF, or, if you prefer to use an e-reader that is also available. I want to give away as many copies of this book as possible so I am asking you to share this on your Facebook page, tweet about it, share in your organizations, families, faith communities and neighborhoods. Please share it with whomever and wherever you see fit. For Immediate Release: Are you looking for a way to Turn your Compassion into Action? 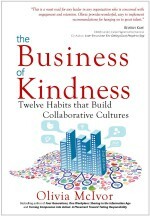 Author, Olivia McIvor, and Publisher, Leslie Nolin of FairWinds Press, want to share Turning Compassion into Action with anyone who wants to do just that—turn their Compassion into Action. They are offering the eBook as a free pdf or at the most nominal price allowed by retailers on other platforms. Inspired by a maintenance man, author Olivia McIvor asked this question of herself and the people she met over the course of two years. Turning Compassion into Action shares the stories she received from others and inspiration she discovered through research, work and scrubbing the granite floors at Mother Teresa’s Home for the Destitute and Dying in New Delhi. WHY a free ebook offer? Around the globe, millions are searching for ways to reach out and respond to current events in ways that will make a difference. 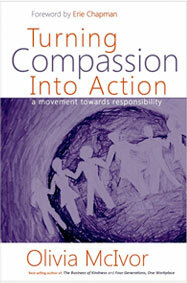 Turning Compassion into Action was written by compassion advocate & human resources expert Olivia McIvor. Her wish is to offer aid and inspiration and to facilitate compassionate action NOW! This sourcebook is filled with stories from people who put compassion into action—in ways large and small. It contains a Contemplative Reading Guide to use individually or with others in a book club or as part of an action club. This offer is a way of sending kindness to people who need it right now and to invite those who have the capacity to influence compassionate action to do so. We will send you the free pdf version straight from our office here in Canada. There’s no catch. We won’t add your name to any list, or sell your contact information to a 3rd party. We just want to do our part for our local and global community. It is English only at the moment – our apologies for this. Please list your full name and email address in the body of the email. That’s it! The cover is a new 2017 cover for this offer, but the content is the original! If you would prefer it on one of the many other platforms, the cost is managed by the host. These prices are the sellers required prices in order to have this book listed on their platforms. We have worked with these retailers over this past weekend to reduce the prices to the lowest possible price. We will receive no funds on these transactions – it simply is the required price by the hosting seller. Our hearts go out to all impacted by tragedy and violence. We hope that we will find our way to more peaceful times soon.